The Model that directly replaces it is the NexSys Boiler unit. 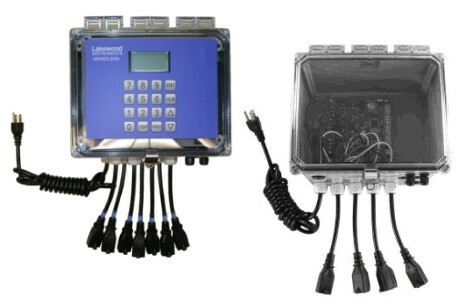 The Lakewood Model 2855e Multi-Boiler Controller uses LonWorksP®P Technology for accurate control of your boiler system. The system will allow control of one to eight boilers using the cycle sample or continuous sample method. Two water meter inputs are available which can be used to feed chemicals. Each conductivity input contains its own microcontroller which talks directly to the relay that controls the motorized ball valve for each boiler. The 2855e can be programmed with LRWS (Lakewood Remote Windows Software) or from the keypad of the controller. LRWS allows data to be accumulated on all boilers, water meter inputs, chemical pump on time and more. Control results in fuel savings by preventing excessive blowdown. Prevents carryover due to excessive conductivity. One controller can monitor and datalog up to 8 Boilers. 2855e LonWorks Technology based multi-boiler cycle sample or continuous blowdown conductivity controller. Standard range is 500-10,000 µS and can control up to 8 boilers. 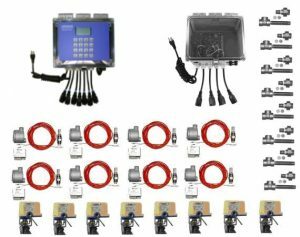 The controller has a total of 8 relays, the first 4 of which are configurable for HIGH/LOW alarms or feed chemical based on 2 makeup sources, the second 4 relays are used for boiler blowdown control. For 5-8 boilers, a NRLY will need to be purchased. Requires one SR2N or SR4N and a PL5, PL6 or GV per boiler (NIN included). -RS2L Communications node with LRWS program.NRLY Four additional relays with enclosure, also available with receptacles and power cord. SR2N Boiler water sensor with NCON and enclosure, ¾ inch NPT; rated to 600 psi @ 486°F (41.4 bar @ 252°C). This sensor cannot be used after a sample cooler.SR4N 4-electrode sensor with NCON and enclosure, ¾ inch NPT; rated to 250 psi @ 392°F (17.2 bar @ 374°C). valve only. Does not include piping.